Bathroom carpet has quite a few advantages. It is warm underfoot, softer if you drop anything and is quieter than tiles. It is also about the only way to change the look of a bathroom floor without the mess and expense of taking up old tiles and putting down new ones, so bathroom carpet can solve a lot of problems, even in rented accommodation, as it can be taken up easily if you move. You should only use carpet intended for bathrooms. The backing must be non-slip and water resistant You can also use kitchen carpet and indoor-outdoor carpets including artificial grass carpeting. Here is how to carpet your bathroom. 1. 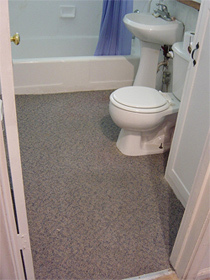 Mark out a full sized pattern of your bathroom floor from wrapping paper or other large sheets of paper. Tape the paper together with adhesive tape, overlapping the seams about 2 cm. 2. To mark around fixtures such as toilet bowls, cut a slit in the pattern from the wall to the front edge of the fixture, and another slit the width of the fixture. Fit the paper around the fixture and score with the blunt edge of a pair of scissors, following the shape where it meets the floor. Cut the shape made by the score and test against the fixture to ensure you have a good fit. 3. Lay the paper floor plan upside down on the carpet. Secure it with adhesive tape or pins so it won’t slip while cutting. 4. Cut the carpet out following the floor plan. Use a sharp knife, razor blade or similar, trying not to cut the pile. If necessary, trim the carpet for more precise fit around fixtures. If your bathroom has any heavy traffic areas, it is a good idea to fit small rugs around fixtures to protect the carpet from excess wear. It can normally be vacuum cleaned, or taken up and draped over a clothes line then hosed clean and left to dry.